I have used several brands of pastel pencils over the years, but the pastel pencils by Caran D’Ache are the most rich in pigment and the most opaque to use. I am reviewing this box of 40 pastel pencils. They are not cheap. 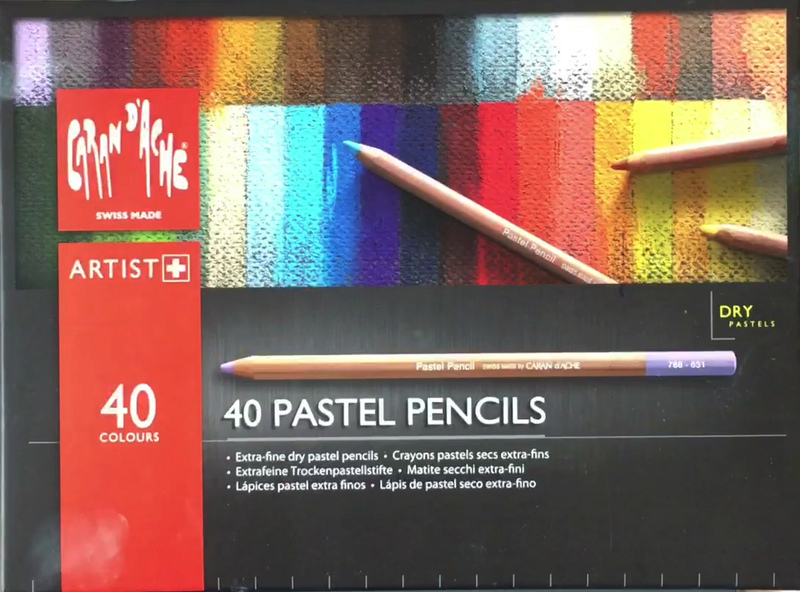 This box costs around $125; that comes down to $ 3.00 a pencil. Caran D’Ache is a company based in Switzerland. They have been making pencils and pastel pencils for artists for over hundred years. When you open the box it you see the first set of 20 pencils. It comes with a piece of sand paper to sharpen the pastel pencils. And a booklet about the history and other products by Caran D’Ache. 631, 093, 105, 069, 066, 033, 035, 047, 046, 408, 009, 008, 003, 002, 901, 541, 044, 746, 741, 042, 719, 229, 245, 232, 212, 732, 161, 661, 140, 620, 149, 089, 070, 060, 571, 300, 512, 820, 821, 011. These are dry pastels and they all have a high pigment. The pencils are arranged by number. These are all the 40 pencils in this box. There is also a bigger box of 84 pastel pencils. All the pencils you can buy separately. On the back of the pencil you see the color of the pencils and also indicated with the number. I started out with a smaller box of twelve Pastel Pencils. And With that box I have draw many different artworks. The pastels also work great in combination with water colours. I first paint the watercolorist and later add highlights or other elements with these Caran D’Ache Dry pastels. Because of the dry pastels they are more opaque than other pastel pastel pencils. Never sharpen your pastel pencils with a pencil sharpener. The point will break and you might ruin your pencils sharpener. Use a Stanley knife to sharpen your pencils. Hold your pencil and set the knife to the pencil and scrape off the wood. You can sharpen the point with the knife as well. But for an even finer point you can use the rough sandpaper that comes with the box. For this demonstration I am using Pastelbord by Ampersand. It feels like very fine sandpaper. You can work with pastel stick but also the Caran D’ Ache Dry pastels. They blend very well. On the PastelBord you can work in many layers, because the tooth of the board absorbs the pastels. It also brings out the vibrant crystals of the pigment. This set of 40 pastels has a great range of colors and values. I am using a blender to blend the colors. For bigger parts you can use your fingers. In this second sample I am drawing or painting Little Angel on Pastel Bord. Pastels are high pigments and a lot of artists call them paintings instead of drawings. I first set up the basic drawing with white and the use a range of grey pastel pencils to shade everything in. I apply it very rough in the beginning to get different values in the painting. Then I blend all the colors with some blend tools. They are blenders by Royal Talens. They are rubber brushes you can do some precise blending with. After I have finished the drawing of the foreground I apply white with a pastel stick. Especially for larger areas it is better to use pastel sticks. After I have applied the white pastels. I use a light blue pencils to blend with the white. These Caran D’Ache pastel pencils blend very well with pastel sticks. I also apply some yellow and orange and blend it in with my finger. Because the pigments are so strong in these Pastel Pencils, you don’t need to apply it over and over again. You can apply the colors on top of other colors and they will be quit opaque. I also tested out the Caran D’Ache pastel pencils on top of a Gouache painting I did. Pastels always work best on top of paper that has a tooth or structure. The structure of the gouache is a great base to apply pastels on top. 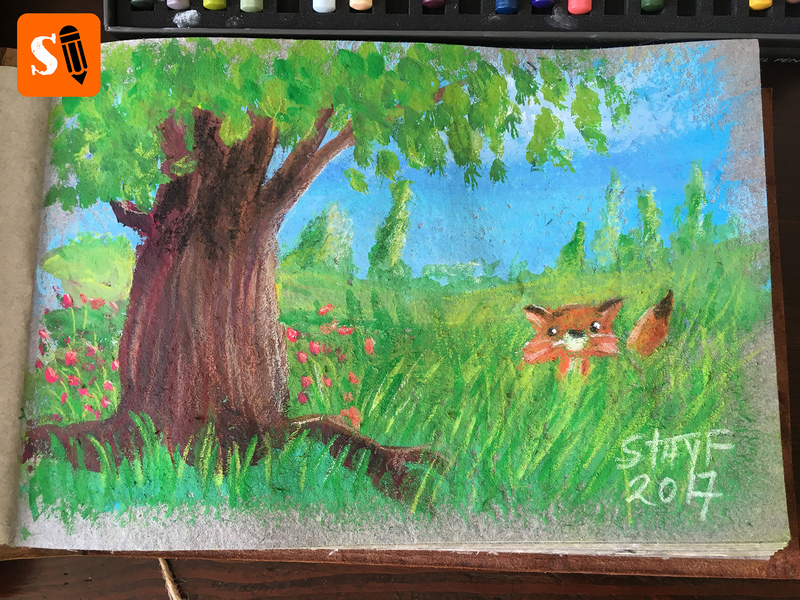 I painted a little fox on top of the green background and I could apply it and the pigments hold up very well. 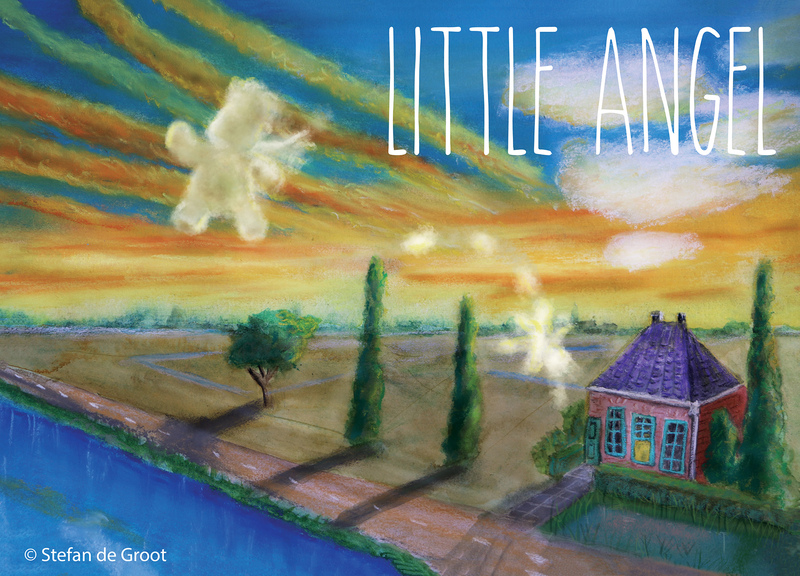 For the picture book Little Angel I also used the Caran D’ Ache Pastel pencils. This is one of the illustrations of the Little Angel Picture Book that is now available on iBooks. I first painted everything with watercolours and then applied the pastel pencils for the clouds and to highlight some areas in the painting. I have used several different brands of pastel pencils but the pastel pencils by Caran D’Ache are the most versatile. 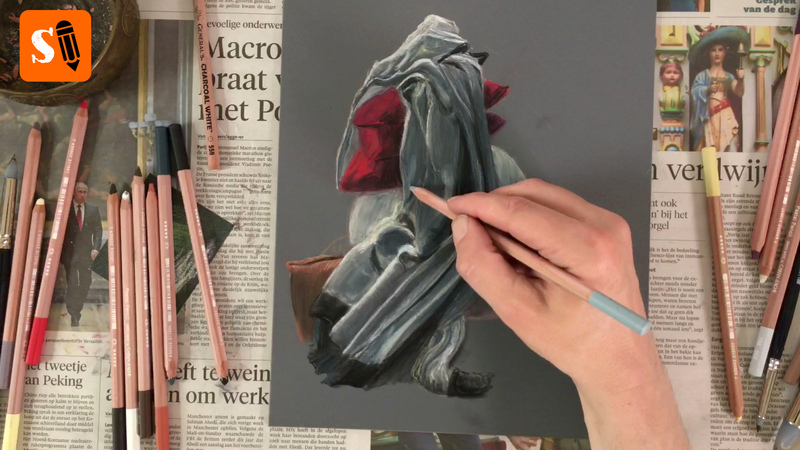 You can create great artworks by just using the pastel pencils, or use them on top of watercolours and gouache. You can buy the Caran D’Ache pastel pencils box on Amazon. These are affiliate links. If you click on the links I will get a small percentage of the sales. It does not cost you anything, but you will support me in making more reviews like this.